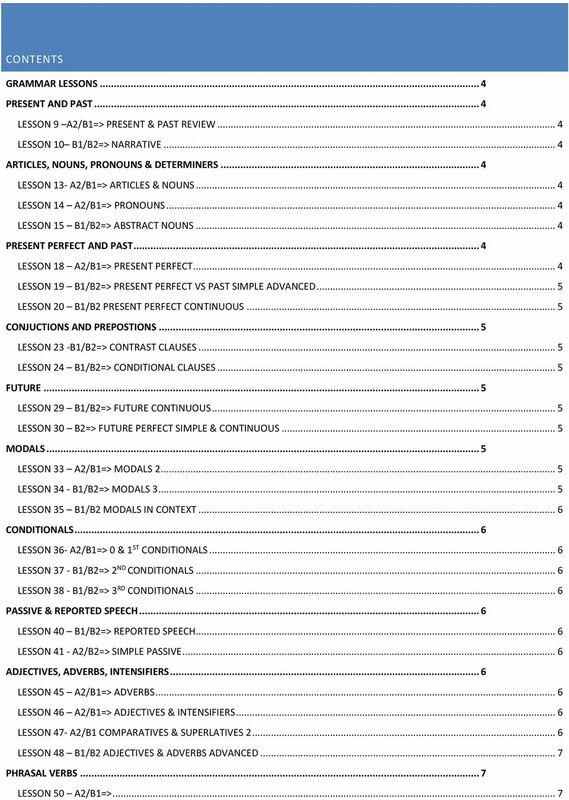 Download "LESSON PROGRAMME INTERMEDIATE B1 OPEN ALL LANGUAGES"
4 LESSON PROGRAMME LESSON 9 A2/B1=> PRESENT & PAST REVIEW - Review of Simple past and present continuous - WH questions and negatives in the past - Past Continuous (all forms) - Used to LESSON 10 B1/B2=> NARRATIVE - Past simple, past perfect (narrative) - Past Continuous (narrative) - Used to (narrative) Would expressing habit in the past INTERMEDIATE (B1) GRAMMAR LESSONS PRESENT AND PAST ARTICLES, NOUNS, PRONOUNS & DETERMINERS LESSON 13- A2/B1=> ARTICLES & NOUNS - common problems with count/uncount nouns - Zero article with countable and uncountable nouns: She has blond hair; I love pizza; I ve got bad news; who wants coffee? - A few and few, A little and little - Graded Quantifiers: Many/Much - More Most - Quantifiers with Countable & Uncountable nouns LESSON 14 A2/B1=> PRONOUNS - Subject and object pronouns - Subject pronouns - There/it/they - Direct and indirect pronouns - her friends/to my friends - Reflexive pronouns - myself/themselves LESSON 15 B1/B2=> ABSTRACT NOUNS - Revision: Most, some, lots of. - Articles & nouns - Colloquial and abstract forms: A great deal of time, money, trouble etc. - All the, most; both (of), neither (of), either (of); fewer, several etc. - All, every and whole/entire - Singular quantifiers: Each and every LESSON 18 A2/B1=> PRESENT PERFECT PRESENT PERFECT AND PAST - Present perfect 1: He has lost his wallet; have you got your results; Have you ever? ; She hasn t been to Scotland. 5 - Present perfect vs past simple: I have done / I did - For and since; When?and How long? - SPEAKING: Storytelling & describing past activities - (have you ever?) 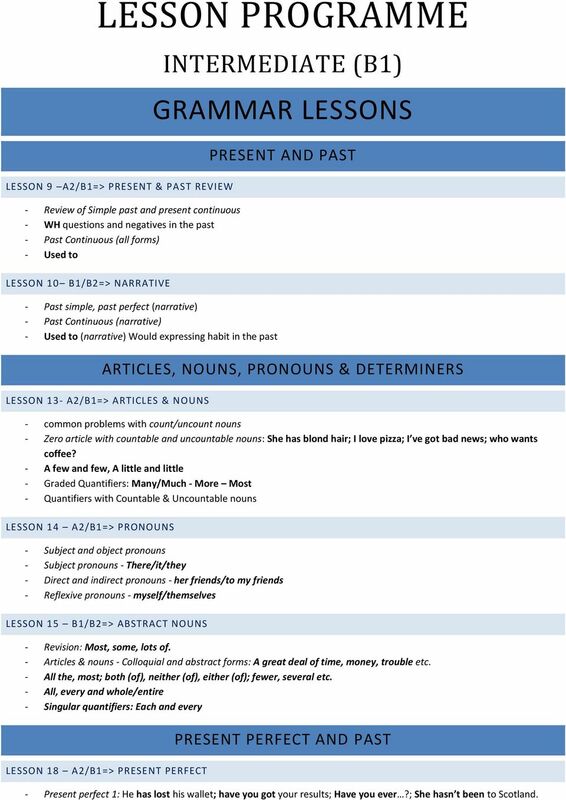 LESSON 19 B1/B2=> PRESENT PERFECT VS PAST SIMPLE ADVANCED - Present perfect 2: She s just gone to the shop; I ve started but I haven t finished yet; He still hasn t arrived. - Present perfect, past simple: I ve been to Thailand twice. I went there in 2003 and Have you been there? LESSON 20 B1/B2 PRESENT PERFECT CONTINUOUS - Present perfect continuous: It s been raining non-stop for two days now; how long have you been playing tennis? - Past perfect: The train had left when I got to the station; When I got home, Joan had already cooked supper: They had already paid by the time I asked for the bill. 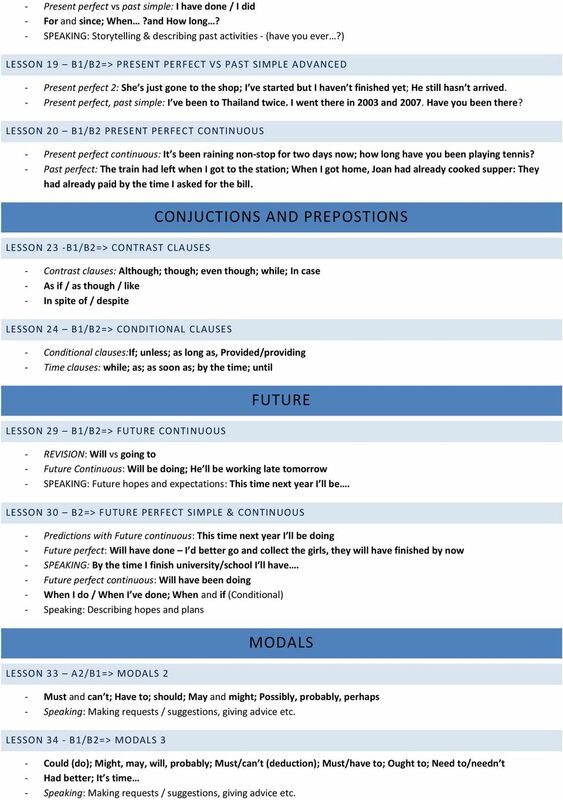 LESSON 23 -B1/B2=> CONTRAST CLAUSES CONJUCTIONS AND PREPOSTIONS - Contrast clauses: Although; though; even though; while; In case - As if / as though / like - In spite of / despite LESSON 24 B1/B2=> CONDITIONAL CLAUSES - Conditional clauses:if; unless; as long as, Provided/providing - Time clauses: while; as; as soon as; by the time; until LESSON 29 B1/B2=> FUTURE CONTINUOUS FUTURE - REVISION: Will vs going to - Future Continuous: Will be doing; He ll be working late tomorrow - SPEAKING: Future hopes and expectations: This time next year I ll be. LESSON 30 B2=> FUTURE PERFECT SIMPLE & CONTINUOUS - Predictions with Future continuous: This time next year I ll be doing - Future perfect: Will have done I d better go and collect the girls, they will have finished by now - SPEAKING: By the time I finish university/school I ll have. - Future perfect continuous: Will have been doing - When I do / When I ve done; When and if (Conditional) - Speaking: Describing hopes and plans LESSON 33 A2/B1=> MODALS 2 MODALS - Must and can t; Have to; should; May and might; Possibly, probably, perhaps - Speaking: Making requests / suggestions, giving advice etc. LESSON 34 - B1/B2=> MODALS 3 - Could (do); Might, may, will, probably; Must/can t (deduction); Must/have to; Ought to; Need to/needn t - Had better; It s time - Speaking: Making requests / suggestions, giving advice etc. 6 LESSON 35 B1/B2 MODALS IN CONTEXT - could have (done); Should /might / may have been etc. - Supposed to have - Can t have, needn t have - READING: text LESSON 36- A2/B1=> 0 & 1 ST CONDITIONALS CONDITIONALS - 0 & 1 st conditionals: If I stay in the sun, I get a headache; If I fail my exams, my father will be angry. - SPEAKING: What happens if you? LESSON 37 - B1/B2=> 2 ND CONDITIONALS - 2 nd conditionals: If I won the lottery, I d buy a big house; - Speaking: What would you do if you won the lottery? LESSON 38 - B1/B2=> 3 RD CONDITIONALS - 3 rd conditionals: I would have told him if I had seen him. 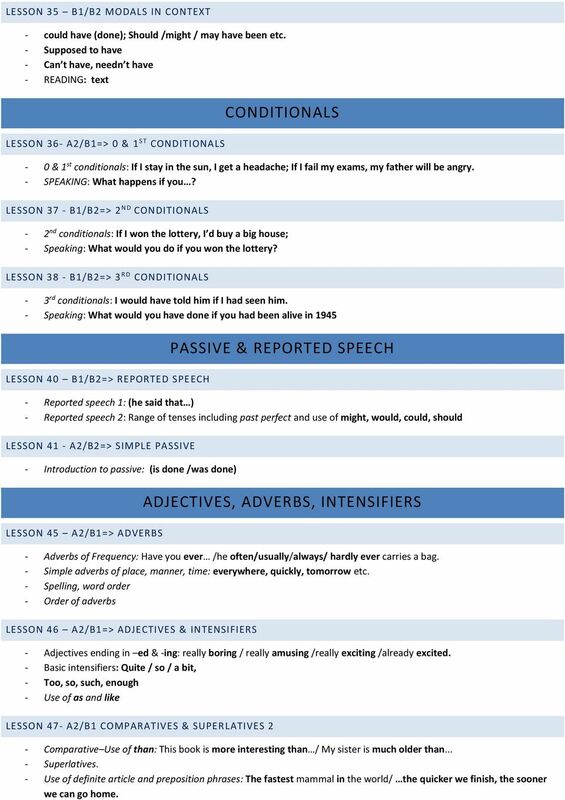 - Speaking: What would you have done if you had been alive in 1945 LESSON 40 B1/B2=> REPORTED SPEECH PASSIVE & REPORTED SPEECH - Reported speech 1: (he said that ) - Reported speech 2: Range of tenses including past perfect and use of might, would, could, should LESSON 41 - A2/B2=> SIMPLE PASSIVE - Introduction to passive: (is done /was done) LESSON 45 A2/B1=> ADVERBS ADJECTIVES, ADVERBS, INTENSIFIERS - Adverbs of Frequency: Have you ever /he often/usually/always/ hardly ever carries a bag. - Simple adverbs of place, manner, time: everywhere, quickly, tomorrow etc. 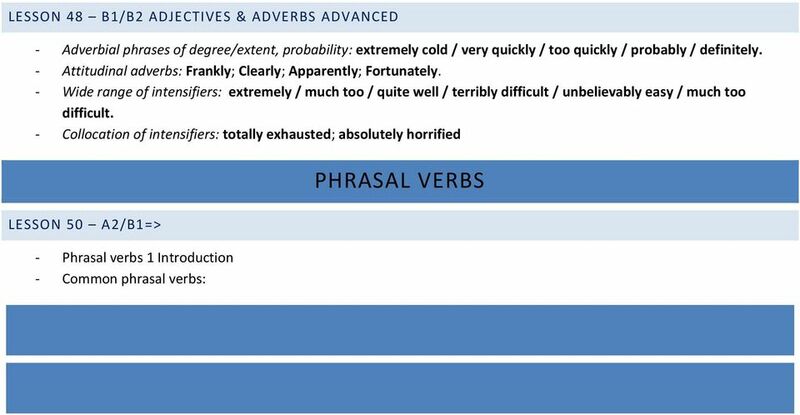 - Spelling, word order - Order of adverbs LESSON 46 A2/B1=> ADJECTIVES & INTENSIFIERS - Adjectives ending in ed & -ing: really boring / really amusing /really exciting /already excited. - Basic intensifiers: Quite / so / a bit, - Too, so, such, enough - Use of as and like LESSON 47- A2/B1 COMPARATIVES & SUPERLATIVES 2 - Comparative Use of than: This book is more interesting than / My sister is much older than... - Superlatives. - Use of definite article and preposition phrases: The fastest mammal in the world/ the quicker we finish, the sooner we can go home. 9 - SPEAKING: Discussing various News articles and current affairs etc. - LISTENING & READING: Gap-filler and reading exercises designed to improve listening and reading skills. 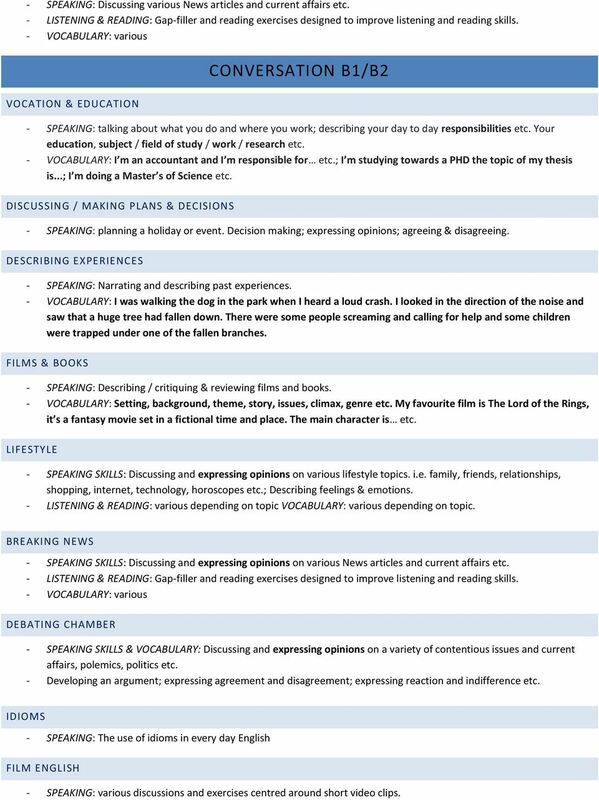 - VOCABULARY: various VOCATION & EDUCATION CONVERSATION B1/B2 - SPEAKING: talking about what you do and where you work; describing your day to day responsibilities etc. Your education, subject / field of study / work / research etc. - VOCABULARY: I m an accountant and I m responsible for etc. ; I m studying towards a PHD the topic of my thesis is...; I m doing a Master s of Science etc. 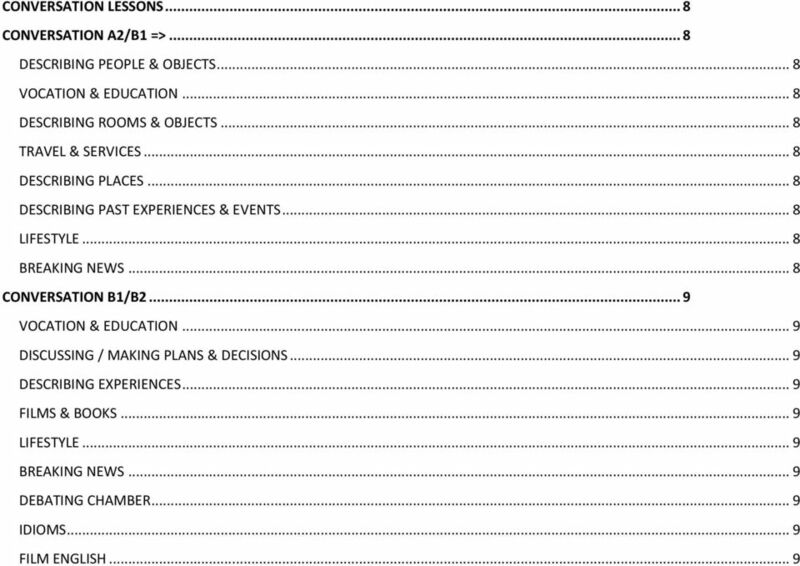 DISCUSSING / MAKING PLANS & DECISIONS - SPEAKING: planning a holiday or event. Decision making; expressing opinions; agreeing & disagreeing. DESCRIBING EXPERIENCES - SPEAKING: Narrating and describing past experiences. - VOCABULARY: I was walking the dog in the park when I heard a loud crash. I looked in the direction of the noise and saw that a huge tree had fallen down. There were some people screaming and calling for help and some children were trapped under one of the fallen branches. FILMS & BOOKS - SPEAKING: Describing / critiquing & reviewing films and books. - VOCABULARY: Setting, background, theme, story, issues, climax, genre etc. My favourite film is The Lord of the Rings, it s a fantasy movie set in a fictional time and place. The main character is etc. LIFESTYLE - SPEAKING SKILLS: Discussing and expressing opinions on various lifestyle topics. i.e. family, friends, relationships, shopping, internet, technology, horoscopes etc. ; Describing feelings & emotions. - LISTENING & READING: various depending on topic VOCABULARY: various depending on topic. BREAKING NEWS - SPEAKING SKILLS: Discussing and expressing opinions on various News articles and current affairs etc. - LISTENING & READING: Gap-filler and reading exercises designed to improve listening and reading skills. - VOCABULARY: various DEBATING CHAMBER - SPEAKING SKILLS & VOCABULARY: Discussing and expressing opinions on a variety of contentious issues and current affairs, polemics, politics etc. - Developing an argument; expressing agreement and disagreement; expressing reaction and indifference etc. IDIOMS - SPEAKING: The use of idioms in every day English FILM ENGLISH - SPEAKING: various discussions and exercises centred around short video clips. GRAMMAR (Verbs) Choose the correct verb to complete each sentence. The main clause can also be at the beginning of the sentence. In this case, don't use a comma. SAMPLE. Grammar, punctuation and spelling. Paper 2: short answer questions. English tests KEY STAGE LEVEL. Downloaded from satspapers.org. EiM Syllabus. If you have any questions, please feel free to talk to your teacher or the Academic Manager. PROGRAMA DE INGLES TSU D CA 04 R02. El presente documento se encuentran los programas de ingles básico e intermedio de nivel TSU. Year 1 and Grammar Expectations I can make a noun plural by adding a suffix e.g. dog dogs, wish wishes. I can add a suffix to a verb where I don t need to change the root word e.g. helping, helped, helper. English. Universidad Virtual. Curso de sensibilización a la PAEP (Prueba de Admisión a Estudios de Posgrado) Parts of Speech. Nouns. THE UNIFIED EXAMINATION (JUNIOR MIDDLE LEVEL) MALAYSIAN INDEPENDENT CHINESE SECONDARY SCHOOLS ENGLISH LANGUAGE SYLLABUS. Straightforward Advanced CEF Checklists Choose from 0 5 for each statement to express how well you can carry out the following skills practised in Straightforward Advanced. 0 = I can t do this at all. 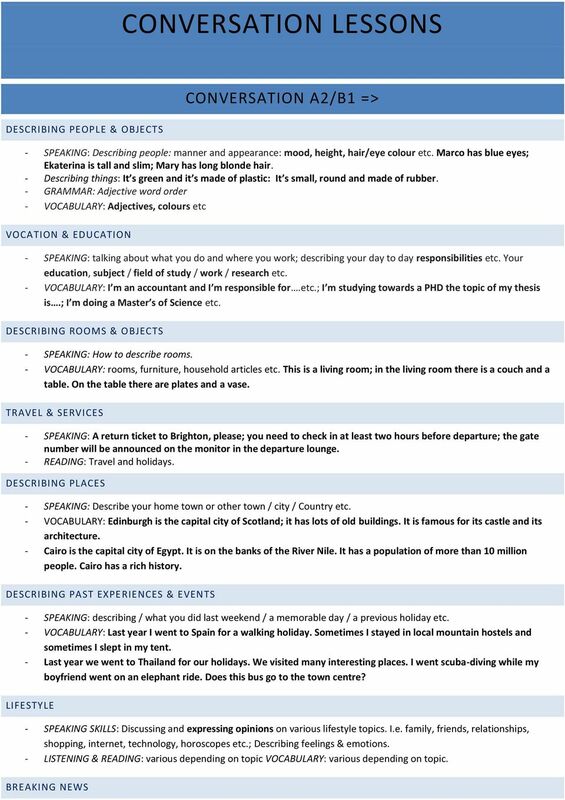 English Skills: Structuring Sentences Workshop 6. Promoting excellence in learning and teaching. Contents: 2008 www.perfect-english-grammar.com May be freely copied for personal or classroom use. PLACEMENT TEST A2. Complete the sentences. Use the correct comparative or superlative of the adjectives in brackets. 1. Why do we use adjective clauses? Walter Published by Oxford. 1) A/an shows that we are talking about 1 person or thing. 2) The usually means you know which one(s) I m talking about.